Markets wail and gnash their teeth as “normalization” of Italian yields sets in. But note that until May 26, the two-year yield was still negative as part of the ECB’s interest rate repression. On that fateful day, the two-year yield finally crossed the red line into positive territory. 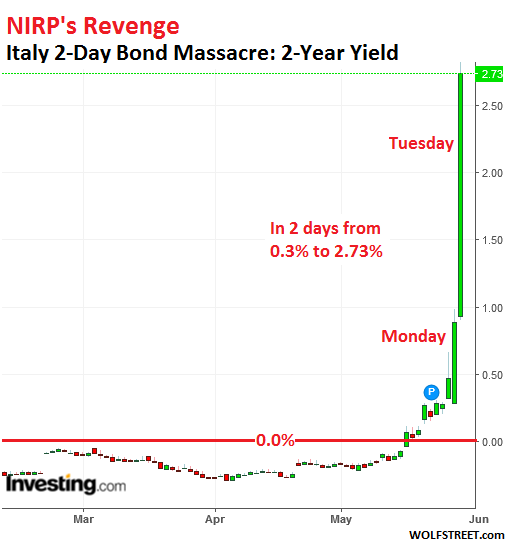 To this day, it remains inexplicable why the ECB decided that Italian yields with maturities of two years or less should be negative – that investors, or rather pension beneficiaries, etc., who own these misbegotten bonds, would need to pay the Italian government, one of the most indebted in the world, for the privilege of lending it money. But that scheme came totally unhinged just now. But here’s the thing: Italian bonds – no matter what maturity – should never ever have traded with a negative yield. Their yields should always have been higher than US yields, given that the Italian government is in even worse financial shape than the US government. Italy’s debt-to-GDP ratio is 131%, and more importantly, it doesn’t even control its own currency and cannot on its own slough off a debt crisis by converting it into a classic currency crisis, which is how Argentina is dealing with its government spending. The central bank of Argentina recently jacked up its 30-day policy rate to 40% to keep the peso from collapsing further. That’s the neighborhood where Italy would be if it had its own currency. 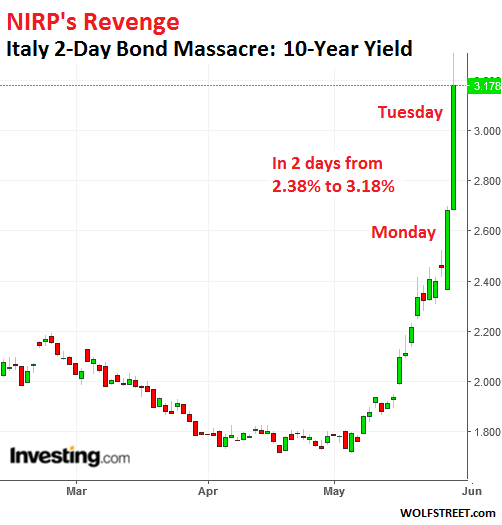 But the ECB’s QE shenanigans and NIRP drove even Italian yields below zero, and so now here is NIRP’s revenge. But just a little. In fact, Italian yields are in the process of “normalizing,” but they’re doing it swiftly, rather than “gradually,” as the Fed likes to emphasize at every opportunity for a very good reason: It took the Fed over four years to push up the two-year Treasury yield by 210 basis points. Italy accomplished the same feat in less than two days. OK, normalization can be painful after years of NIRP. But just today – on the worst day for Italian bonds in Eurozone history – the government was able to sell €5.5 billion ($6.4 billion) six-month bills maturing in November 2018, at an average yield of 1.21%. Let that 1.21% stew for a moment. In the US, today, the 6-month yield closed at 2.06%! So the Italian government is still borrowing at a lesser cost than the US government. Italy’s yield normalization has a long ways to go! This was up from a negative yield of -0.42% at the prior six-month auction at the end of April. Oh my, how it hurts to have to pay interest on borrowed money, rather than getting paid for borrowing. I can hear the wailing and gnashing of teeth in Rome and in the markets around the world. This six-month yield had reached an all-time high of 8.65% in November of 2011 and an all-time idiotic low of -0.48% in November last year. It needs to be way higher than it is today to account for at least some of the risks. This yield normalization – or bloodbath, as others call it – comes on the heels of the for now failed struggle of two anti-establishment parties, one on the left, the other on the right, to form a coalition government. Various members of these parties suggested to just blow off €250 billion of Italian bonds that the ECB has stupidly acquired, introduce an alternate currency, cut taxes, and raise spending. If this ideas had come to fruition, government bond yields would have spiked into the double digits, and a real default with big haircuts for investors would have been all but certain at those yields. Now the plan is off, the coalition hopes are in shambles, new elections are likely, and Italian voters get to sort this out, once again in their manner, in the voting booth. Yet rates are still negative out to 3 months. Looks phony to me. Scare tactics. Not impressed at this time. Central banks have a lot more influence on yields with very short maturities. They essentially control the overnight rates. And this impacts maturities that are near that… so up to about three months. The ECB’s Deposit facility rate is still negative -0.40%. The main refinancing operations rate = 0.0%; and the marginal lending facility rate = 0.25%. Italian yields of very short maturities are controlled by those dynamics. It’s when you go further out on the curve that central bank influence gets more tenuous. True. But still it makes one wonder how unreactive those rates were while others sky-rocketed to still far below-market rates. More food for thought … the internet says there’s no bid for Italian bonds besides the ECB. If so, who caused these bond rates to rise? And on what volume? Wonder how libor/eurobor affects the longer duration rates? The FAANG stocks are barely changed. It’s only a crisis if those start to be liquidated. We have a Global Financial Market. It’s ridiculous to think a real crisis in Italy will be contained just to Europe or even Italy. Every time a 10-year yield goes over 3% somewhere, some folks want to see a global financial crisis, and if it doesn’t happen, they’re disappointed…. This is just about Italian yields going back to normal, not about a global financial crisis. Stock markets getting rattled is NOT a global financial crisis. A GFC is when credit freezes up, and when payroll checks of big companies bounce because credit stopped flowing GLOBALLY. The italian president put a cap on this Yield blowout, by rejecting the Coalition finance minister. What we have here IMHO. Is a Hiatus which will last until new direction is found, post election, or a government, that survives a confidence motion. If the Appointed Prime-minister can for a Government. That pleases, the league, Five-star, and survives a confidence motion. He should instantly be award a decoration for political genius. It should also be noted the new “Socialist” German Finance Minister. Is being accused by Eu counterparts, of being just as “Miserly” if not more so, than Schauble. It look very much like Draghi will not be able to stave off France and Club-Meds days of reckoning, for much longer. That italy manged to sell its last bond placement is still due to the ECB, italian Bank’s, and Fund’s, using OPM. When you look at the shift in rates, than is still really a vote of “No confidence” in italy, by even those risking OPM..
Amazing people are still buying, even at a modest positive rate. I’m not sure about any bonds these days. Farm and forested property yes, paper and promises no. This business of the President forcing a technocrat government on Italy is the worst possible outcome for the nation. The whole Euro zone is a dead man walking. The neo-liberal foundation behind the EU has permanently crippled the whole endeavour. It can only crash, and the sooner the better while the damage is manageable. The longer it drags on the more intractable will be the problems. Germany may think it has the upper hand, but it’s just hanging on too. Give back the nations’ monetary sovereignty. Keep watching Deutsche Bank, their shares are dropping like a stone, very much a European issue. I’d say DB is more a global issue Just like Lehman was But what do I know? Soros thinks it’s worldwide. He made his billions as a currency speculator. Wonder what he’s shorting, these days? The EU will not crash, instead it will grow stronger. Bet on it. I see nothing that would cause the EU to grow stronger. They will stumble on as those countries in the Eurozone will find it very difficult to extricate themselves from this profoundly undemocratic institution. For how long do you think the Euro can last? The ECB doesn’t have room under its debt cap (which is set by the various national gov’t comprising the EU….of which Germany is the most powerful member and the most resistant to extending any more lifeline to Southern Europe) to continue buying up all the sovereign debt that Southern Europe MUST continue to issue…regardless of the interest rate. Both the EU and ECB leadership….as well as all the other central bank heads and economic ministers can easily predict the LATEST date at which the Euro will spiral into crisis. It is inevitable by plain mathematics….the more pertinent question is how MUCH longer can the EU leadership delay the devil’s payment for the debacle in political unrest and revolt against Brussel’s unelected de facto control of Europe. I give it less than 2 years (2020)…..at the outside. If next winter is as cold as the last….you are going to see food inflation and disease start to take its toll on the social contract that support even the NATIONAL gov’ts….less alone the OVERLORD one. This depends on if the EU goes for the greater integration (a lot of noise in the need for this in the wake of brexit vote) or not. How does Italy compare to say Texas which also doesn’t control its own currency and issues debt? Federalisation could be on the table in a year’s time. Italian long bond has a “free market” yield circa 15% – 25% or higher. If you think Italy is bust yield could be way higher. ECB has kept it arbitrarily low. ECB withdrew from the market Monday and Tuesday to put pressure on 5-Star and the League. But looks like the ECB ponzi is under increasing pressure instead. League & 5-Star (combined) recently won a majority of parliamentary seats. Today’s action by the Italian president seems to fly in the face of the voters. Interestingly, League & 5-Star voter support only seems to be increasing. The EU has an unpleasant habit of ignoring voter sentiment, or forcing repetitive votes until they get the “right” answer. National finances, sovereignty and democracy are taking quite a beating. Hi Javert, you’re right the EU has a history of ignoring certain countries voting against the wishes of the EU. Ie Ireland Lisbon Treaty. This Italy story is the biggest example of how undemocratic the EU is. The EU didn’t listen after the Brexit vote that they need to change. In Europe, elections are really just the mechanism for distributing the best jobs to the top people, who know best, and the voters are not otherwise heeded….. Remember the late Hollande, jeering at the people he – a ‘socialist’ – called the Sans Dents? The ‘toothless’ ones, the plebs. ……. Indeed, Cynic, and Cameron’s crew in England called those supporting Farage/Brexit “swivel-eyed loons”. 1) Continue to imply that he will stop monetizing Euro government and bank debt and set in motion a cascade of government defaults and bank failures. 2) Pull back from his suggestion that the ECB will stop creating Euros to monetize a bunch of bad debts and set in motion the collapse of the Euro currency. Of course there may still exist a rocky middle trail to continue kicking the can. This path involves a slow continued slouching toward mediocrity and a compromise between smaller debt defaults and slower destruction of the currency. I don’t discount the middle road, for nine years, when it looked like events would finally reach an interesting conclusion, only the powers that be delayed the reckoning for a later day. But the vise is getting tighter. Seems to me they don’t have much choice but the middle rocky road. Now as quickly as Super Mario is pressing the Ctrl-P buttons manually though, it’s still nothing compared to Banca d’Italia’s old keyboard which had a dedicated Ctrl-P button permanently soldered in the pressed position. The day before the Euro came into existence the Lira was trading for about 1,000 Deutsche Marks. If there was one thing you could count on back then was that every two years Italy will get a new government and that the Lira will always go down in value. An attempt to return to the lira would be the biggest wake- up for Italy since the invasion in WWII and the fall of Mussolini. It would be such a disaster it might even be a good thing in the long run. The lira might not be convertible, it might not be money outside Italy. Note: all lira enthusiasts: before the euro, large purchases in Italy, e.g., real estate, were in US dollars. It was a second tier- currency INSIDE Italy. All this ‘populist’ BS… every time a country gets in financial trouble, it has the same cause. A populist politico who wants to get elected by promising goodies, including government jobs and pensions. See from A to Z: from Argentina to Zimbabwe. Populist demagogues wrapping themselves in flags and promises. Once more than about 25 % of the work force is pubic sector, democracy is pretty much overthrown. The outcome of an election is predetermined by the bloc. In the Argentine province of Argentina. it hit 50 %. Who is left to produce the stuff all these bureaucrats want to buy with their government- printed scrip? Yeah, the populists are two faced. They rail against the Germans and the ECB and demand to be freed of the “cage” set by them. However, they conveniently “forget” that without them they would be charged true market interest rates on their debt — which would put all of their grand populist promises to shambles overnight. This^^ Italy and the EU are not parting. The UK was stupid to leave but thats ok. When a majority of your exports go to the EU just a few km’s aways its makes sense LOL. Greece has not left nor will Italy. They literally cannot afford to leave. The EU is all they have left. The UK is a joke. IF a vote were held today they would rejoin. I think you will find they still are in $. which tells you A LOT. I think this reaction is slightly behind the curve. The president decided to ignore the eurosceptic parties and appoint a technocrat pending the vote of confidence. Then it’s forwards for another round of elections with perhaps the establishment facing the electorate’s rage, e.i. Lots more uncertainty, the market’s favorite. It wouldn’t surprise me if Spain followed suit on Wednesday. The only people buying this junk are forced to buy it. Not true. The two parties DID form a coalition as their broad directions were the same, but the sticking point was President Sergio Mattarella, who refused to okay the appointment of Paolo Savona as Finance Minister. The MSM is making A Big Deal of Savona’s age (81…tell that to George Soros!) but the real sticking point was that Savona had, in previous years, planned a euro-exit strategy. Quelle horreur. As Varoufakis (shafted Greek FinMin) pointed out, there’s no treasurer anywhere (including in Germany) who hasn’t thought out this scenario, so Mattarella’s refusal smacks of subservience to Brussels rather than loyalty to Italy. The new PM, Giuseppe Conte, a guy appointed by Mattarella, will not be able to form a government as nobody from any party wants to work with him. This will lead to new elections in August. Presidente Mortadella will melt like a mozzarella come fall. ps. How dare you sir presume Italians eat equivalent of popcorn. That low class snack.. How about Bruschetta and Crostino o magari gelato e cafe? They probably quite deliberately proposed an unacceptable candidate as FM, in order to increase their vote next time around. Let’s await the next move. Now that’s a good point, @Cynic. And they will, judging by the reactions to (ha ha, thanks @Lenz) Prez Mortadella. I commented before but it may have got swallowed. I said that Italy had better watch it or it, too, may go the way of Poland and Hungary and be labelled an “illiberal democracy”. Quotable quote: “The European Union was meant to be a gentleman’s club.” Indeed. The Visegrad countries refuse to allow an invasion of foreign migrants. That is a crime that won’t be forgiven by the CFR. Your election results are SO not cool, but we’ll be nice and give you guys one more chance to get it right. This is what I find frustrating about European bond pricing…. Of course, Italian debt trading at significantly lower yields than US debt is just obviously mispriced, anyone with a brain has known that for years now. Problem is, it’s impossible to know when the market forces will come alive and violently reprice it to something approximating its true value, as has happened today. Isn’t whatever the market is paying the true price? The Euro was designed with a fatal flaw, and that is lack of a single, unitary bond-issuing Treasury. A confederacy of sovereign nations united under a single currency is, in a sense, like an old-fashioned gold standard, only with arrogant bureaucrats in Frankfurt controlling the gold on behalf of the bankers and Euro elites. I see that the Council on Foreign Relations has named Poland, Hungary and Turkey “illiberal democracies” (along with usual Russia & Venezuela). If Italy continues on this path, it, too, shall become an “illiberal democracy”! Populist pasta! Quotable quote: “The European Union was meant to be a gentleman’s club.” No sh*t, Sherlock. Its wasn’t designed with it, just enacted with it. I hate “false new’s”. One of the founding fathers of the Eur.. The Eur, was to be (and still may be), that weapon of force. Blame Germany, so much easier than blaming the real problem in France and club-med, banking NPL ratios, and State deficits. I’m sorry but this thing is not true …. Which part exactly is not true? As of right now, May 31, the coalition has failed to form a government. And they’re all talking wildly in all directions. Does anyone other than the ECB buy these bonds? I can not understand why anyone would seek a lower yield at higher risk, when they could by a US bond instead, knowing that a US default is essentially impossible. Probably why the USD keeps heading north lately. The relative value of risk seems to be reflected in currency these days. My take is, 5Stars and NL will negotiate with the President and form a Government. Maybe also Fratelli d’Italia will join. Forza Italia will stay at the opposition and the media controlled by Berlusconi will gradually start pushing against Salvini. Mediaset is a powerful tool for building consensus. It created Forza Italia from thin air in less than 3 years. After that, future is unpredictable. This is why this is a wonderful, free world. Correct me if I am wrong but if I remember correctly bond yields move in the opposite direction of value. This means high yields translate into low values, meaning those billions worth of Italian sovereign bonds held by banks large and small throughout Europe (not merely the EU) are now worth a lot less, meaning these banks have a serious asset problem. In the case of the sick man of Italian banks, MPS, the problem is truly serious because these sovereign bonds they hold are over 200% of Tier-1 capital. As 68% of MPS shares are State-owned this presents yet another problem… MPS could end up like Dexia, fully nationalized, but there’s no government to negotiate with EU and ECB officials, just caretakers whose powers are very limited. This is happening as Deutsche Bank shares continue to melt: on Monday evening they were down 40.1% from their late January peak. Differently from Italian bonds this has been a nearly continous slide downward, not a fall off a cliff. A lot of people have woken up and discovered Europe has done absolutely nothing to cure its huge banking issues, nothing but a lot of fast-talking and paid-for shill pieces. All eyes are obviously on Frankfurt and honestly I am curious to see what verbal contorsions ECB officials will try this time to appease financial markets. The decision on what to do, as François Mitterand rightly said, rests not with them but with the European Council: ECB officials only have to talk up the markets and take care of technical details. I think the European Council will be very split in this case. On one side ordering the ECB to charge in guns blazing, would send financial markets up but only short and destroy whatever credibility the ECB has left… if any. As US monetary policies are showing, rebuilding a central bank’s credibility after years spent catering to every whim of market partecipants is extremely hard. On the other letting the bond crisis unfold and ignoring the wailing from financial markets may prove the right answer, especially if followed by some form of financial tightening in the Fall, but it will make a whole lot of people unhappy. As cheap credit is now considered a given by many, be them business owners or individuals, the natural and long delayed normalization may cause a larger political crisis down the road. Excellent argument, MC01. Much food for thought. Thanks! In terms of the banks being exposed to Italian debt: The Italian banks are heavily exposed to Italian debt. Other banks, not so much. The CBP Netherlands Bureau of Economic Policy Analysis released a report on this with details. It ran a scenario assuming a default and a 20% haircut on all Italian government debt. It found that overall, banks in Italy would lose 29% of their core capital (#1), banks in Belgium 15% (#2), and the rest is single digits to zero. Some individual banks are more exposed, particularly in Italy. But ironically, the Irish bank Depfa Bank would also lose 50% of its core capital (assuming an Italian default and a 20% haircut). I had in mind some specific banks, such as BNP-Paribas and our old acquaintance, Banco Sabadell. BNP-Paribas in particular was touted as “one of the five most solid banks in the world” in a series of what I can only call shill pieces… mere days before their €16 billion worth of Italian sovereign bonds started to be worth a whole lot less. Granted, it won’t topple such a big bank, but it made me wonder how many similar “investments” they have on the books and how solid they are if the largest shareholder (the Belgian government) cannot intervene in case of a crisis. And that link… thank you, it’s very interesting. And telling. I thought French banks had considerably reduced their exposure to NPL’s but turns out like in Italy the process is slower and more difficult than I foolishly expected. Too much politics in both cases. Watch the Fed’s supposed hawkishness evaporate with these latest developments. The chance of a rate hike in June just went to zero. The central banks will keep playing extend-and-pretend until the global financial system collapses under the weight of its own fraud and mark-to-fantasy accounting. Please read whole articles not just fragments of headlines. You drive me nuts with this discombobulated factual-sounding nonsense. The market prices in an 85% chance of a rate hike in June. That’s down just a little. What plunged was the probability in the market’s eyes of FOUR rate hikes in 2018. The market thinks there will be three rate hikes in 2018, with the fourth rate hike reduced to a 20% probability. BTW, in this rate hike cycle, “the market” has always underestimated the Fed’s willingness to hike rates in six months or further out because this market is given to wishful thinking. You tossed in the political solution at the very end, and after reading some it appears that the populist coalition (together) has a solid majority should they hold new elections. Trump once said he would mark down US bonds, from his mouth to their ears. Down south, we prefer calling it, what it is, BS. 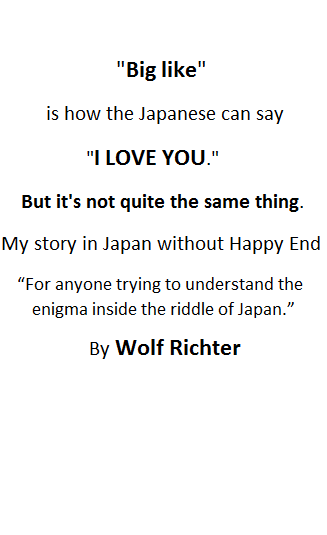 Its easier. Leaves the boys more time for Beer. Market pricing of most assets these days based on wishful thinking. Odd to me that leverage is so high given the major crashes in 2001 and 2008. Ecb now punishing Italians for democratic vote… obviously after coordination with Italy pres and orders from Germany… a pressure cooker. Is Italy to be crushed like Greece? Or, has Brexit got Italians to reflect how their growth compares with Germany since the happy day they all signed up? It seems like the “risk premium” is now about whether or not there will be a bailout from the ECB. And, to what extent? The usual relentlessly upbeat perma-bulls are urging the muppets to buy moar stawks…because they truly have our best interest at heart. And a few days later, Bear Stearns crashed from $60 to less than $2. Central banks are byuing investor’s panic and selling oxygen to the capital suffocation since years, god knows for how long in the future. Buying sovereign bonds from a country with chronic economic problems, and at negative yield…what could possibly go wrong? Now sitting on capital loss AND having to pay interest to the bond issuer. Genius! Well worth their fees. perhaps sitting in two year treasuries might be safe. boring. tepid. as to italian bonds, the rates went up, and now there are buyers. but the concept of loaning the italian government money for 10 years at 3% is unpalatable. as to us 10s……better things to do. I heard Italy has a fiscal deficit that is much lower than the US deficit, at a time when the US fiscal deficit is set to double in a few years. The US will have just as much debt as Italy (as a percentage of GDP) in a decade or so. It’s time we stop comparing the Italian debt yield to the US yield, as though US debt is some sort of gold standard. But us owes money in its own currency. It is sovereign, can pay any debt in that currency. Debt was higher after WWll… at the time, the fear the economy would collapse under the debt. Never paid, and never a problem. Italy owes money in a currency of which it is not sovereign, cannot pay any debt in euros. Us is also not Argentina. Argentina and its companies borrowed in foreign dollars because rates were lower… this is currency arbitrage, a losing bet when us rates rise. They’ve done this before, seriously burned before. An expected outcome. In the past the Italian lira simply fell in value over time as their inflation rate exceeded Germany’s. Import prices rose, Italians buy fewer Mercedes and more fiats. No problem. They and the other med countries are being strangled by the euro… eventually the electorate will recognize this and go thru the major pain of divorce. They cannot compare. The US fiscal deficit is unlimited because the nation is monetary sovereign. Italy lost it’s sovereignty so it has to tax or borrow to pay for its deficit, just as the rest of us have to do. The EU central bank can give them the euros though. It’s highly likely they will be obliged to do so, or else face a worse crisis. The issue is ability to repay. Are you saying the US debt is not a problem because the US can simply print more currency and inflate the debt away, while Italy cannot? I suggest this is wrong thinking. The inflation of a currency is a default in substance, when the degree of actual inflation is not built in or anticipated as part of the interest rate. From that standpoint, the US is no different than Italy. It appears both countries will be defaulting on their debts either through straight default or inflation. Also, from this standpoint, the US is soon to be in a worse position than Italy. But Angela Never Knew !